Reach out for some of the most powerful holistic self-healing tools! 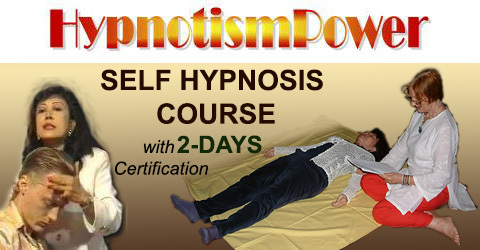 Learn Self Hypnosis in a power-packed 2-day event! She trains participants to sustain motivation by systematically reprogramming the sub-conscious mind, utilizing the great powers of suggestion and imagery to achieve individual goals. Maximize your strengths to achieve full potential! Know the truth about the mind, how it works and what you can do to condition it to think in ways that will serve you best. You will identify the impacts of thoughts on mind and on the resulting achievements and failures in our lives. You will be better informed about the kind of ideas, thoughts and beliefs you need to implant in your mind to realize your life goals, and those you must repel. You will understand how you can reprogram your mind to adapt to a positive habit pattern of thinking that will lead you to success. Understanding the inherent power within us as human beings to achieve our goals and the need to condition our minds to co-create a better condition to succeed in life, how the mind transforms our thoughts into reality. You will be taught how to systematically programme the subconscious mind in order to sustain motivation, and how to utilize the great powers of imagery and visualization when striving towards individual goals. Learn self-help to eliminate:- Bad Habits: Smoking, alcoholism, obesity, phobias and allergies negative attitudes, drug abuse. Stress Related Problems: Insomnia, depression, anxiety, anger tantrums, tension headaches, bereavement. Thus achieving greater confidence to perform better at both work and play. Group Hypnotherapy : "Memory Retention of Lessons Learnt "